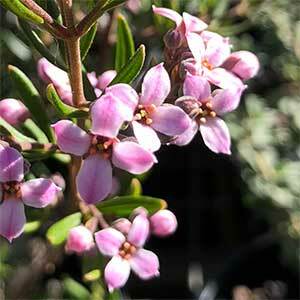 This is a low growing form, compact in growth habit, Zieria ‘Pink Crystals’ with its masses of starry flowers, mainly in late winter to spring is a real bee magnet. It is easy to grow and makes a good feature plant in a cottage garden or in the general garden border. Plant in a well drained humus rich soil in a sunny position. A little afternoon shade is suitable in hot dry areas. Choose a well drained humus rich soil. In wet or clay soils consider mounding or hilling up the soil to improve drainage. Water through the first summer and in long dry periods. A annual application of a specialist native plant fertiliser each spring can help with growth in areas with very poor soils. This is naturally neat growing plant and requires little to no pruning. Foliage – Mid to deep green and soft.